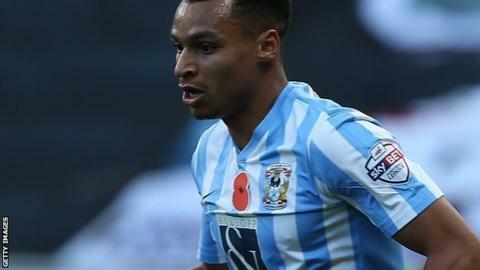 Coventry's Jacob Murphy scored twice against former club Colchester as the Sky Blues came from behind to win. The U's went ahead when Macauley Bonne guided in Callum Harriott's low cross, almost doubling their lead when Marvin Sordell struck the inside of a post. Murphy's shot on the turn brought the visitors level before the ex-Colchester loanee then rounded keeper Jamie Jones to put Coventry ahead at the break. Marc-Antoine Fortune sealed City's victory, tapping in after Jones' error. The closest Colchester came in the second period was when Gavin Massey's shot was well saved by Sky Blues keeper Reice Charles-Cook. Tony Mowbray's men bounced back from their shock FA Cup first round exit at home to Northampton to go second in League One, behind leaders Gillingham on goal difference. Colchester, who drop a place to 17th, have now conceded 37 goals in 17 league games this season. "It's a difficult place to come. It was a difficult game and it was great travelling support. I hope they're travelling back up the road pleased. "We controlled it for long spells and deserved the points. We were fully respectful of this Colchester team and the threat they carry. "Jacob Murphy stepped up to the plate and I am delighted he got his goals. It's the next three points for us." Match ends, Colchester United 1, Coventry City 3. Second Half ends, Colchester United 1, Coventry City 3. Corner, Colchester United. Conceded by Reice Charles-Cook. Attempt saved. Callum Harriott (Colchester United) right footed shot from outside the box is saved in the bottom right corner. Attempt saved. Gavin Massey (Colchester United) right footed shot from the right side of the box is saved in the bottom right corner. Attempt saved. Marvin Sordell (Colchester United) left footed shot from outside the box is saved in the centre of the goal. Attempt missed. Ryan Haynes (Coventry City) right footed shot from outside the box is close, but misses to the right. Attempt blocked. George Moncur (Colchester United) left footed shot from outside the box is blocked. Attempt missed. Gavin Massey (Colchester United) right footed shot from the right side of the box is close, but misses to the left. Aaron Martin (Coventry City) is shown the yellow card for a bad foul. Foul by Aaron Martin (Coventry City). Macauley Bonne (Colchester United) wins a free kick in the defensive half. Ryan Haynes (Coventry City) wins a free kick in the defensive half. John Fleck (Coventry City) wins a free kick in the defensive half. Foul by Alex Gilbey (Colchester United). Substitution, Coventry City. Conor Thomas replaces Jim O'Brien. Jim O'Brien (Coventry City) wins a free kick on the left wing. Foul by Callum Harriott (Colchester United). Substitution, Coventry City. Ryan Haynes replaces Ruben Lameiras. Frankie Kent (Colchester United) wins a free kick on the left wing. Foul by Jim O'Brien (Coventry City). Attempt saved. Matthew Briggs (Colchester United) right footed shot from long range on the left is saved in the centre of the goal. Foul by George Moncur (Colchester United). Jacob Murphy (Coventry City) wins a free kick in the attacking half. Substitution, Colchester United. Gavin Massey replaces Tom Lapslie. Substitution, Coventry City. Marcus Tudgay replaces Marc-Antoine Fortuné. Attempt missed. Alex Gilbey (Colchester United) right footed shot from outside the box is just a bit too high. Jacob Murphy (Coventry City) wins a free kick in the defensive half. Attempt missed. Matthew Briggs (Colchester United) left footed shot from the left side of the box is just a bit too high. Alex Gilbey (Colchester United) is shown the yellow card for a bad foul. Foul by Marc-Antoine Fortuné (Coventry City). Frankie Kent (Colchester United) wins a free kick in the defensive half. Marc-Antoine Fortuné (Coventry City) wins a free kick on the right wing. Aaron Phillips (Coventry City) is shown the yellow card for a bad foul.